South Texas rancher Gilbert Saenz remembers the first time he caught one of his sheep nibbling on a plastic grocery bag. It was a few years back. "I thought it was eating some flowers and then I got up closer and saw a plastic bag in his mouth and I had to basically come after it and get it out of its mouth," he said on Tuesday, adding that "Sheep are hard to catch." 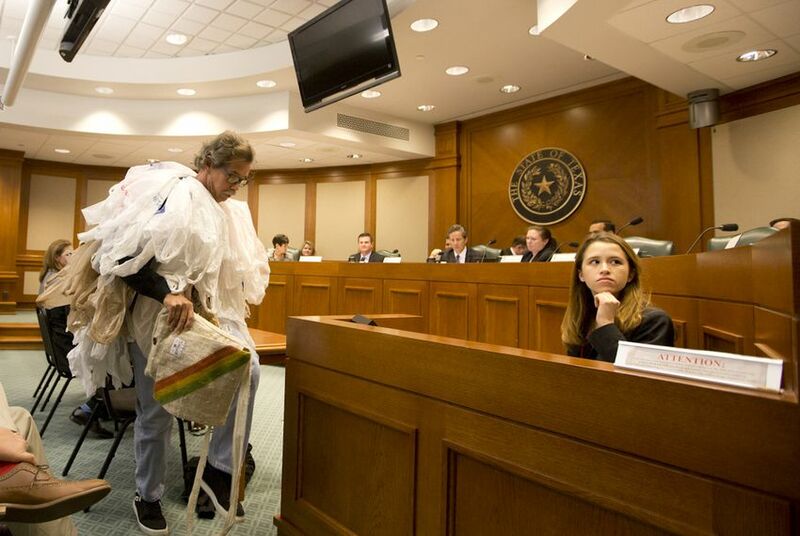 Saenz was testifying before the Texas Senate's Business and Commerce Committee on legislation aimed at cracking down on the growing number of plastic bag bans around the state. He joined other ranchers and a host of city officials in opposing Senate Bill 103, authored by Sen. Bob Hall. Under the legislation, cities would no longer be able to ban grocery stores and other businesses from providing single use plastic bags or charge a fee for them. The legislation would nullify at least 10 existing local ordinances restricting plastic bag use, including in Austin, Brownsville and South Padre. At Tuesday's hearing, Hall said these cities "overstepped their authority" in banning and imposing additional fees on plastic bag usage. The Edgewood Republican said there was a common misconception about the dangers of plastic bags, and described them as “ the most environmentally friendly option for transporting groceries.” Today's grocery bags are 100 percent recyclable and do less harm than paper alternatives, he said. Saenz, who runs a ranch of about a dozen sheep in the tiny town of Freer, is also the city attorney for Freer and helped draft the most recently passed bag ban ordinance. Although his sheep survived, Saenz had heard horror stories from fellow ranchers in similar situations. A cattle rancher told him plastic bags frequently suffocated his livestock. One time when he found a bloated dead cow on his ranch, he cut one of its four stomachs open and found heaps of plastic bags. Bennett Sandlin, executive director of the Texas Municipal League, told the committee that cities pass bag bans for a variety of reasons — from agricultural to environmental — and that uniformity isn’t the solution. A statewide ban would be “overkill," he added. Sen. Judith Zaffirini said she was concerned about invalidating existing city ordinances and was quick to question Hall on Tuesday. The Laredo Democrat noted that her home town and other cities along the border have a problem with bags getting trapped in storm drainage infrastructure. The Texas Supreme Court will decide later this year whether to hear a case challenging Laredo's bag ban. The legislation, which is currently pending, is among several measures filed in recent years aimed at curbing local control. Several environmental groups testified against the bill Tuesday. Joseph Seinsheimer, chairman of the Galveston chapter of the Surfrider Foundation, dressed up as a self-proclaimed “bag monster” with dozens of plastic bags wrapped around his upper body. He described plastic bags as “the modern day Texas tumble weeds. They’re escape artists, floating easily into the air and water for long distances." The Texas Campaign for the Environment brought up the bill's potential impact on a number of different industries. Andrew Dobbs, who testified on behalf of the organization, told lawmakers plastic bags wreak havoc in recycling facilities since they get caught, melted and stretched in the machinery. Plastic bags also impact the cotton ginning industry, he said, since those harvesting cotton fields sometimes pick them up and the material gets sent into the gins and shredded into cotton. Dobbs dismissed findings from a 2011 study Hall cited, which found that reusable bags play a role in the cross-contamination of foods. He said that the bacteria they found in the bags they tested are ubiquitous and not harmful. “We’ve had a ban on bags in Austin for four years and there’s been no indication of an increase in food-borne illnesses,” Dobbs said. A state court struck down the city's bag ban in August. According to the ruling, cities cannot “prohibit or restrict, for solid waste management purposes, the sale or use of a container or package.” It noted that the bags businesses distribute are viewed as “containers” under the law. Another city the in Rio Grande Valley — Brownsville — felt the brunt of this verdict in October, when Texas Attorney General Ken Paxton sued the city over an ordinance that charged an extra $1 for consumers who chose to use the plastic bags distributed by businesses. Citing that lawsuit and the recent court ruling, Bryan Mathew of The Texas Public Policy Foundation told the committee that “plastic bag bans are bad policy” and “violate current state law.” Mathew, a policy analyst at the conservative think tank's Center For Local Governance, which has been vocal in its opposition to bag bans, was the only person to testify in favor of the bill on Tuesday. Mathew said bag bans have not “meaningfully reduced litter" and are a “drain on local businesses" because consumers will take their business to more convenient shops outside city limits to avoid them. "The bag ban is only one of several tests for local powers this week. City ordinances on restrooms, ride-hailing, short-term rentals and sanctuary cities are also being called into question." Last October, Texas Attorney General Ken Paxton sued the city of Brownsville for their $1 per-transaction fee on single-use bags offered at grocery stores and other businesses. The policy, first enacted in 2011, collects about $71,000 per month for the local government.